The largest of our best-selling FireStar range can store 4 large files - ideal in the office. Digital keypad with 4-16 digit PIN. Weight: 53Kg, Size: 515 x 405 x 440mm (HxWxD). 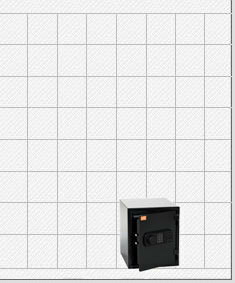 † Add 40mm to external depth for hinges and handle and keypad. Safe	The FireStar Large by Safe is from our own brand of multi-purpose fire and security safe and is ideal for use at home or in the office for protecting important paper work and digital media such as external hard drives from fire and theft. This safe comes with a recommended insurance rating of £2,000 cash or £20,000 valuables and is also tested and certified to NT Fire 017 - 60P standard to offer up to 60 minutes fire protection for paper documents. The safe door is secured by a battery powered digital keypad which can be set with your own user code. For additional piece of mind there is also a unique master code in the event of a lock out. The safe body is constructed from galvanised steel plate to exacting standards and includes fire resistant barrier material built into the safe walls. The safe body is also finished in an attractive black scratch resistant paint and is prepared for floor fixing by way of pre-drilled holes in the base of the safe, with fixing bolts included. There are also 2 smaller sizes available in this range.